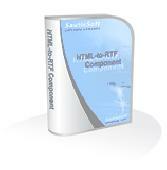 The RTF-to-HTML DLL .Net is a robust and independent .Net assembly to convert Text, RTF documents into HTML/XHTML documents with CSS. The component is 100% created in managed C# and absolutely standalone. It doesn't require MS Office. Batch convert AFP documents IBM MO:DCA (AFP, IOCA and PTOCA) to RTF (Rich Text Format), a format fully compatible with Microsoft Word document (.DOC). The software keeps all document objects such as graphics, searchable text, tables and live forms. Image to RTF OCR Converter can help you make the un-copiable image file to editable word document.